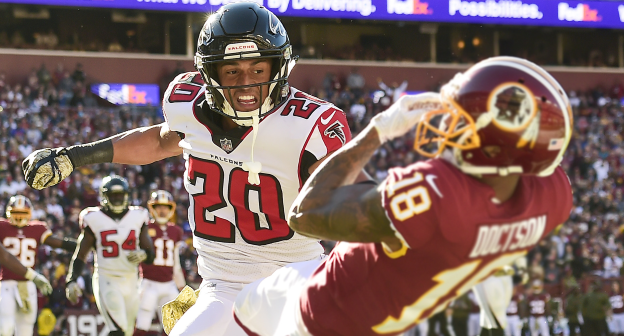 After the release of former starting cornerback Robert Alford this offseason, one of the goals for the Atlanta Falcons was to find the guy to supplant him. Isaiah Oliver, a second year cornerback from Colorado, is set to take the role. In an interview with Kelsey Conway, an Atlanta Falcons website reporter, Head Coach Dan Quinn was asked if Oliver will start alongside Desmond Trufant. Oliver appeared in 14 games in his rookie season, starting two of them. He registered 23 tackles, seven pass deflections and one interception. His lone pick came against the division-rival Carolina Panthers in Week 16. The quarterback was Tyler Heinicke, who started in place of Cam Newton after soreness in his throwing shoulder. Next season, the Falcons have high hopes. This will be the first time the secondary will be at full strength, with the addition of new faces. Damontae Kazee is expected to fill the full-time nickel role after starting at free safety last season. He led the league in interceptions last season with 7. Both Keanu Neal and Ricardo Allen have a timetable to be healthy and ready to participate at the start of training camp. Oliver has all of the physical gifts to be a shutdown corner in the league. At six-foot-one-inches tall and a 33-inch wingspan, he is easily one of the bigger corners in the NFL.